Hannah Genders describes the work that went into her latest garden. 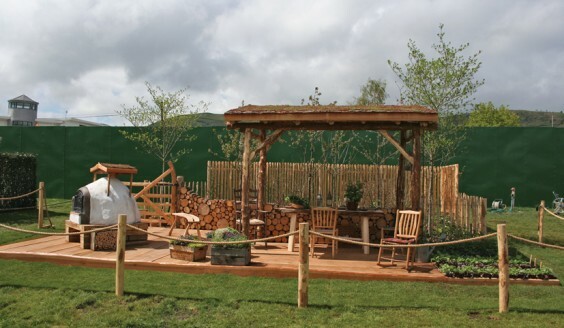 W hat an amazing two weeks It was, creating our Woodland Kitchen Garden at the Malvern Spring Show. The garden was all about sustainability and aimed to show what we can create using products from our English woodlands. I had the help of a wonderful team to build, plant and man the garden, which also involved lighting fires, cooking pizzas and playing music – but more about that later. As so many people have asked me how you put a show garden together in only two weeks but still make it looks like it’s been there for ages, I thought I would describe the process and the fun we had in doing it. Arriving at the site to find our allocated plot – in this case 12 x 9m with the turf removed – I always get a mild sense of panic as I realise we have just 14 days to build, plant and finish our garden. The first job was to get the trees planted. These came from a nursery in Warwickshire and I had tramped round the field to pick them back in January, but hadn’t really seen them since. They were now large, with some in a 100-litre pots – most plants are sold in three-litre pots! There were four sweet chestnuts (I was using a lot of sweet chestnut wood in the garden), three wild cherries and two hawthorns, all under-planted with hazel with the idea of creating a small coppice of woodland at the back of the garden. Once the trees were in, the lovely cleft chestnut fencing was erected around them. The Woodland Co-operative then arrived on site, along with some extra labour to start building the decking area. The ground needed to be levelled for the framework and the stunning one-inch larch boards fixed on top – these came from just outside Worcester and, at about two feet across, looked amazing when laid and received plenty of positive comments. The sweet chestnut structure, which gave the kitchen area some shelter, had been pre-built so was bolted together in place in a relatively short time; it then just needed its green roof laid on top. The beautiful log wall was expertly constructed by Sid from the co-operative. Having done two years of dry stone walling at a Benedictine monastery, he was the right person for the job – firewood has never looked so good! With the decking down and the area that was to be under the oven beefed up, we were ready for Nico and his team to start work building his oven. The wood-fired oven is made from cob, a mixture of clay, sand and straw; this is a traditional English building material which is very sustainable and has been used for thousands of years – think of the cob houses we still see in Devon. It provides a highly insulated but breathable form of cooking and, as we were to discover, makes wonderful pizzas. It took Nico about one week to do this construction, which was all built around a sand mould. The cob is then allowed to dry, a door is cut out and the sand is removed so the oven can be fired, allowing the cob to set. The door came from a reclamation yard in Somerset. This wonderful, organic-looking oven really became the focal point of our garden at the show. Once all the fencing, gate and edging boards were in place it was my job, with help from friends, to do the planting. The woodland area at the back we filled with shade-loving perennials and some native plants like cowslip, bluebell and wild garlic. I also wanted to include others to show what can be grown in a shady garden, so we had Ajuga, Solomon’s Seal and Dicentras, both the tall spectablis and the small foremosa one with fern-like leaves. The planting needed to look full but natural, so I allowed some gaps and dotted around some smaller plants, giving the effect that the plants had self-seeded. We then covered all the gaps with leaves, which felt a bit odd as you usually have to clear them up from a garden, not put them out! The judges were very complimentary about the woodland planting, which had all been grown at a local nursery near Evesham. At the side of the garden was a small vegetable patch. I used the same growers as for my last Malvern show garden and they came up trumps again; we had neat rows of red pak choi, asparagus lettuce and red flowered broad beans. Once the construction and planting is complete, the next job is to finish the garden. Tables and chairs were all made by local craftsmen in Herefordshire, the vintage boxes were planted up with organic herbs and we even had a jar of wild garlic pesto on the table to complete the picture. The final part was to place a guitar in the back corner of the log wall to tell the story of music being played on the garden – I was under strict instructions from my husband Mike (owner of the guitar) to make sure it didn’t get rained on! The garden was awarded a silver medal and we had the most encouraging response from visitors to the show who loved it. It was very interactive as we cooked pizza every day complete with garlic pesto – and, as most of the co-operative and our friends are musical, we had live music in the garden every afternoon. A massive thank you to all who helped make this garden possible.